Considered a playoff contender heading into the 2017 season, the Mariners looked anything but during opening week as they went 1-6 in seven games against the Astros and Angels. In the opening week of their 41st season, the Mariners displayed the traditional lameness that marked the vast majority of the first 40. In seven road games against the Houston Astros (4) and Los Angeles Angels (3), division rivals, Seattle won once, lost twice on walk-off hits, and flopped into last place in the AL West at 1-6, the worst mark in the majors (standings). Since their last playoff appearance in 2001, the Mariners had five other starts of 2-5 or worse — 2004 (1-6), 2008 (2-5), 2010 (2-5), 2011 (2-6) and 2016 (2-5), failing to reach the postseason each year. So this represents the worst opening week since 2004, when the Mariners went 63-99 and fired manager Bob Melvin. In 2014 and 2016, the Mariners paid a price for slogging out of the gate when they were eliminated on the final weekend from postseason consideration. The Mariners seemed as if they would easily recover from a Homer Simpson-ish start to 2017 Sunday with their second win when they took a 9-3 lead over the Angels into the bottom ninth in Anahiem, that lead built in part upon Hisashi Iwakuma’s two-hit ball over six innings and Robinson Cano’s three-run homer and two-run double. But the Mariners gagged and lost, in unfathomable fashion, 10-9 as relievers Casey Fien and Edwin Diaz had zero command of their pitches (box). Beyond that bullpen implosion, the Mariners displayed a stupefying lack of clutch hitting during the week, going 3-for-36 (.083) with runners in scoring position during the four games in Houston and finishing the week 8-for-57 (.140), lowest mark in MLB. During the offseason, GM Jerry Dipoto sought speed and more accomplished on-base guys at the top of the lineup, checking those boxes with the additions of SS Jean Segura and RF Mitch Haniger. Segura produced four multi-hit games in his first seven while Haniger contributed three home runs. But the damage-doers behind them, Cano, Nelson Cruz and Kyle Seager, mostly flailed. They hit a combined 12-for-77 (.155) with one homer and six RBIs. Segura, who came to Seattle in the trade for RHP Taijuan Walker, had a home run and hit .333/.374/.433, making him Seattle’s most productive offensive player on the road trip. Segura became the first Seattle leadoff hitter with four multi-hit contests in the first week of a season since Ichiro Suzuki posted six in 2005. The Mariners took a 3-2 lead into the bottom of the 13th Wednesday in Houston and handed the ball to rookie Chase De Jong, who wouldn’t have pitched if Dillon Overton hadn’t been on the paternity list, awaiting the birth of his first child. Making his major league debut, De Jong got Yulieski Gurriel on a ground ball, walked Evan Gattis and induced Josh Reddick to pop up. Then he allowed former Mariners LF Nori Aoki a wrong-field single. The killer was supplied by George Springer, a walk-off, three-run home run to left center. The Mariners dispatched De Jong back to AAA Tacoma immediately after the game. The ninth on Sunday was a calamity. The 9-3 lead was trimmed when DH Albert Pujols bashed a solo home run (592nd of his career) off Fien. Fien and closer Diaz then collaborated to walk four, allow three singles (including Pujols’ second hit of the inning) and a double for seven runs, including Cliff Pennington’s walk-off single for a preposterous comeback win (before his homer, Pujols had gone 4-for-27). According to ESPN Stats & Info, teams entering the ninth inning were 2,529-1 since 2011, the only loss coming when the Royals defeated the White Sox May 28, 2016. The 3-0 loss Monday marked the fourth time Seattle was blanked on Opening Day. The Mariners also had shutout losses in 1977 (7-0 Angels), 2000 (2-0 Red Sox) and 2003 (5-0 Athletics). The Mariners scratched out three hits in the opener, two singles by Segura and another by Cano. The only opener in which Seattle had fewer wasw1988 when the Mariners had two hits in a 4-1 loss to Oakland. 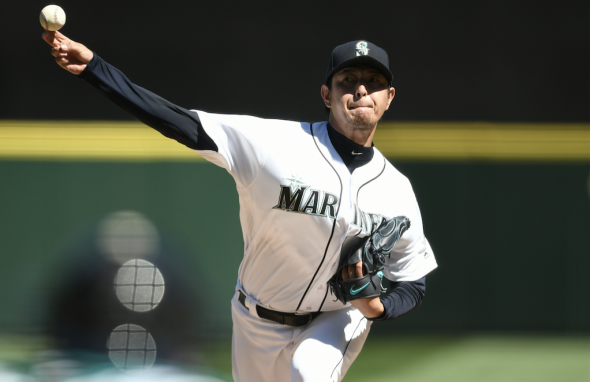 With six strikeouts in five innings Monday, Felix Hernandez increased his career total to 2,270, surpassing Hall of Famer Lefty Grove for 51st on the all-time list. Hernandez also increased his Opening Day strikeout total to 74, moving past Roger Clemens (72) for fifth-most in history. The Mariners scratched out one run in their first two games, losing 3-0 and 2-1. The only other season in which they scored fewer was the expansion year, 1977, when Seattle opened with 7-0 and 2-0 losses to the California Angels. The Mariners also tallied one run in their first two in 1988 when they opened with a 4-1 loss to Oakland and followed with a 6-0 defeat. Before this season, the Mariners opened 0-2 or worse 11 times. In only two of those years – 1991 (83-79) and 2003 (93-69) – did they finish with a winning record. Seattle did not reach the postseason in either year. The Mariners didn’t hit their first home run (Segura off Charlie Morton in the fifth inning Wednesday) until they had played more than 22 innings. In 2016, the Mariners homered in the first inning of their first game. Before facing Seattle Friday, Angels starter Jesse Chavez was 0-6 with a 5.84 ERA in 17 appearances against the Mariners, including seven starts. What does he do? Holds the Mariners to one hit over 5.2 innings en route to the win. In addition to going 3-for-23 at the plate (.130 BA), Kyle Seager, a Gold Glove winner in 2014 and a Gold Glove finalist in 2016, made three errors in his first five games. Jarrod Dyson’s go-ahead, RBI single in the ninth inning Thursday was his first game-winning hit in the ninth inning or later in his eight-year that included nearly 1,400 ABs. Six position players batted under .200, which accounted for the following AL ranks: 15th (out of 15) in runs scored, 12th in home runs, 15th in whiffs, 15th in batting average, 15th in on-base percentage, 15th in slugging, 15th in OPS. Wrong side of history: In the 13th inning Wednesday, Houston’s George Springer became the first MLB leadoff hitter to cap a five-RBI game with an extra-inning, walk-off homer since Pepper Martin of the St. Louis Cardinals in 1933. While the Mariners tallied seven runs in their first three games, Springer had six RBIs. Springer enjoyed an historic opening series. In addition to his walk-off homer, he followed Thursday with a lead-off shot. He became the first player to hit a walk-off and then follow with a lead-off blast the following game since Scott Hairston did it for the San Diego Padres Aug. 3-4, 2007. Springer also became the first player in major league history to accomplish the feat in back-to-back games in the month of April. Mitch Haniger became the eighth rookie in club history to homer twice in the first six games of a season and the first since Kenji Johjima in 2006. Haniger hit another homer Sunday, which traveled 427 feet. The 14-pitch at-bat between Hernandez and Mike Trout in the first inning Saturday was the longest at-bat in either player’s career. Trout fouled off nine pitches before taking a called third strike, the 26th time Hernandez fanned the AL MVP. Hernandez has not struck out any hitter more often. On the flip side, Trout has seven career homers off Hernandez, the most Hernandez has allowed to any batter. The Mariners play their home opener at 2:10 p.m. Monday (Root Sports) to kick off a nine-game home stand that will feature visits by the Houston Astros, Texas Rangers and Miami Marlins. LHP James Paxton will throw opposite Houston RHP Charlie Morton (0-0, 3.00). Excellent synopsis. Really appreciate the research that went into the historical analysis. What to say, but the first week was a cluster—-. Funny how things turn around in baseball though. We’ll see. My 90 win projection is looking tattered and ill-begotten at the moment. But this morning you feel better, right? Baseball is such a gamble and a guess. You can put a great lineup together but that doesn’t mean they will hit with men on base. You can have a great closer and seldom get to use him. If the Mariners stay healthy they may well win 90 games. Odds of team-wide health through 162 games are less than 1 in 10. When Safeco attendance hits 8000 will the Hall Monitors allow fans to move to better seats? See? There you go. Bridge-jumping. Watch them go 9-0 this homestand.